No doubt you will have seen these ramekins all over the place. Sometimes they are unmarked, sometimes they are marked "Korea" or "Made in Korea". The pattern is standard 1970s, common to most makers in Asia at the time. You can find them from Japan, Taiwan and China. What follows is my version of what some of them are. Ji Stonecrest is (or more accurately was) a brand name of Jepcor International Inc. formerly of Chalet Office Plaza, 1000 Skokie Avenue Wilmette Illinois 60091, and 41 Madison Avenue New York. Wilmette is a village in the USA with a population of over 27,000 located approximately 25km north of Chicago on the Western shore of Lake Michigan. They registered various trademarks over the years, that were; Andre Ponche, first registered on the 20th of January 1973, Decostone, Wiltshire House, Stonecrest, Country Cupboard, registered 1973 and Haeng Nam and Mario Registered 1980. These trademarks have now lapsed so if you want to use them, they can be purchased, except Haeng Nam Chinaware was incorporated in Korea as a Limited Company in 2003 and are still going; also having an office in Los Angeles. Jepcor originally manufactured in the USA but later moved production to Korea, with additional manufacturing in Japan. 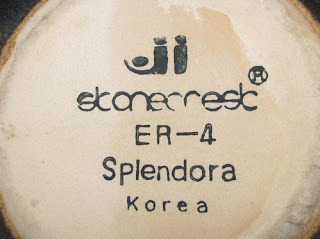 Jepcor had some of their American-made pottery manufactured by Homer Laughlin Ohio. This company still exists and is a leading manufacturer of foodservice china. Haeng Nam Chinaware inc. began production in Korea during the Japanese occupation of the Second World War in May 1942. They later manufactured a wide range of chinaware to many well-known companies including Noritake and Corning. Because Jepcor had registered their name in the USA, Haeng Nam could not use it there until the registration lapsed. In Chinese, Haeng Nam means "Apricot South". Haeng Nam are located at 251-32 Sang-dong, Mokpo-si Jeollanam-do Korea. They make a variety of homewares and export mainly to Hong Kong. The company has also recently started making bathroom products. We can thank the Koreans in part for the demise of the Australian Studio ramekin. Making and selling ramekins was the bread and butter of many Australian potters. When this market was invaded, most local makers folded. Australia still has the economic blinkers on today. We still expect to earn Australian wages and yet we want to pay Asian prices for our manufactured goods, and our Government wants our industries to compete on a level playing field. Some people advertise these ramekins on Internet auction sites as being RARE. Not true! This stuff is everywhere. Please note, Asian counties and cultures have a strong tradition of pottery making dating back centuries. It is better made and glazed than the local stuff, holds more and is generally stronger. It is completely understandable that it outsold our domestic makers. Their ramekins are larger than earlier Australian products and are similar to those made by the Taiwanese. 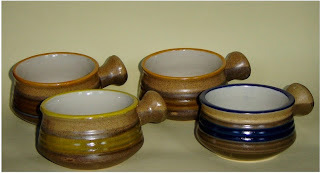 Their ramekins are of a standard size and shape and come in a profusion of colours; one of the most popular being “Desert Sun”, a yellow striped design. Much of their output is advertised as being designed by Andre Ponche (if you like flowers). I have never heard of him, but that isn’t saying much. To my knowledge, Andre Ponche, one of their popular designs is about as real a person as Micky Mouse. Anyway, they are well made and are great as a serving dish at parties. According to the Company registration documents, they are described as making; ‘CHINA DINNERWARE, PORCELAIN DINNERWARE AND EARTHEN DINNERWARE AND CHINA, PORCELAIN AND EARTHEN COFFEE MUGS AND TEAPOTS”. “THE NAME "ANDRE PONCHE," WHICH IS THE MARK, DOES NOT REFER TO ANY PARTICULAR LIVING INDIVIDUAL”. Stoneware is a dense, fine-grained, non-translucent, vitrified clay body that is impervious to liquids and fired at a high temperature (1200º–1350ºC). The clay contains significant amounts of aluminum silicates. Stoneware has partially vitrified bodies and most often are brown, grey or white. An opaque ceramic containing naturally vitrifying clay e.g., stoneware clay or a suitable ball clay. Sometimes a non-plastic constituent and a flux are added. Stoneware is known for its colour glaze as it is inferior to porcelain in whiteness. Stoneware bodies are heavier than Porcelain and Fine Bone China and are not transparent and are usually made of local clay. 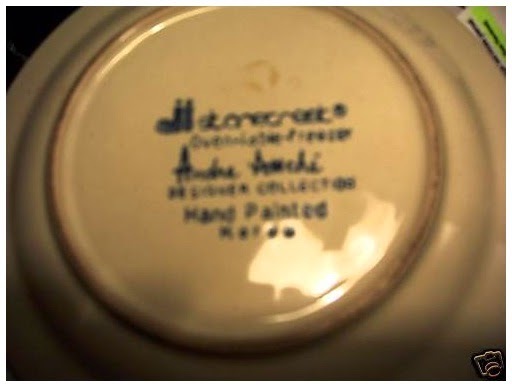 Stoneware is less expensive than both Bone China and Porcelain products.